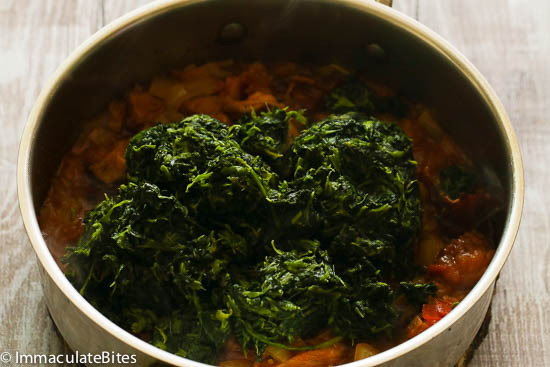 Stewed Spinach – Super simple way of enjoy spinach African style -bursting with a good amount of greens and delivers the perfect amount spice. A quick and easy way of putting greens on the table. 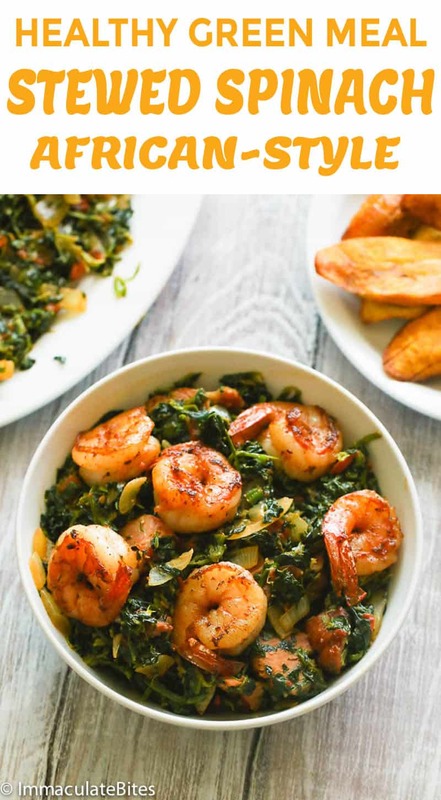 If at times you get caught in a rut doing the same recipes over and over again, here is an African spinach dish that is easy to make, any time of the week with minimal prep work. 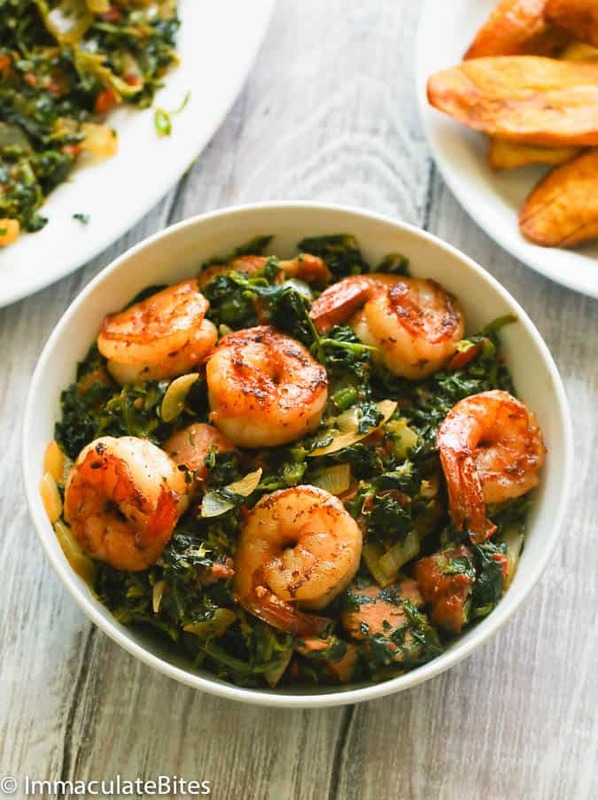 All you need is spinach, tomatoes, onions, shrimp and smoked turkey and you are on your way to a tasty dish. And for added flavor you may use garlic and thyme . This side dish of spinach is one I’ve been making for as long as I can remember, it’s one of my absolute favorite ways of eating spinach (other than eating it raw in a salad)-Simple, rustic, quick and easy, but the taste is remarkably good. Oh yes! My cousin called ,that he was coming over for lunch break and that he was SUPER hungry . I get that a lot, from him. This is when he wants me to whip up something fast . And I always fall for it . Luckily for me , or should I say him, I had some thawed spinach already in the fridge . Got out the rest of ingredients, grabbed some plantains and within 50 minutes I had finished cooking and taken a few pictures for the blog. Doesn’t work like this always but today it just did! I gave myself 10 minutes tops for the pictures. Now can you believe I didn’t have a plate of this deliciousness. Him and hubby wiped the plate cleaned! 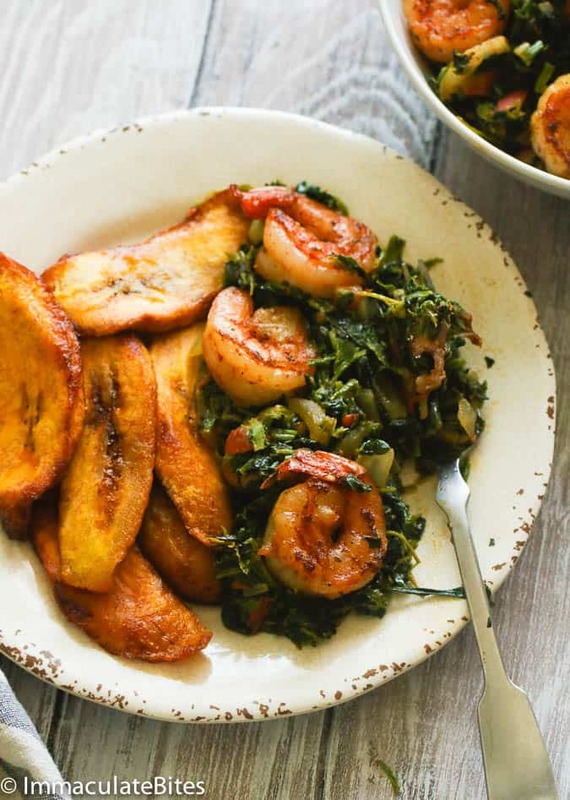 For the health conscious , you may be boil the plantains – Mine was far past the boiling stage – Okay who am I kidding , I love fried plantains was hoping to have some leftover. 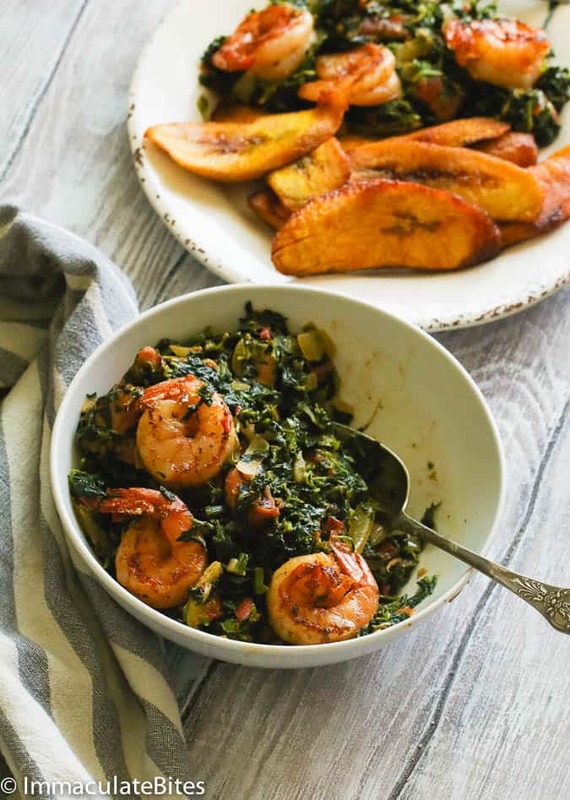 Any starchy meal works – plantains(roasted or fried), corn fufu ,or yam. You may leave out the shrimp but the smoked turkey adds a smoky flavor to the dish. 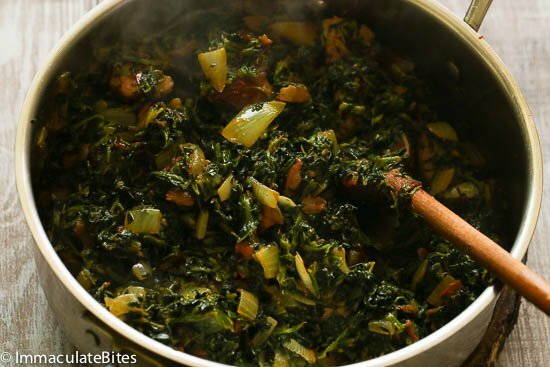 Feel free to swap out the spinach for collard greens, add more spices or play with the spice combination to suit your taste buds. If you have crayfish you may throw it in as well. ½-1 teaspoon cayenne pepper, whole scotch bonnet pepper works too! Heat canola oil in a medium saucepan over medium heat until hot. 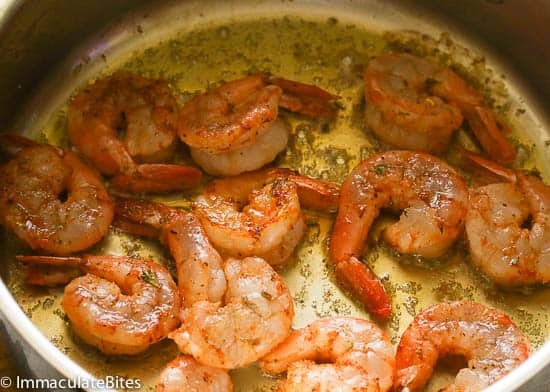 Season shrimp with salt and creole seasoning(salt free) or use favorite seasoning . Lightly sauté the shrimp in about 2 tablespoons oil ,until turns pink about 4-5 minutes. Remove and set aside. 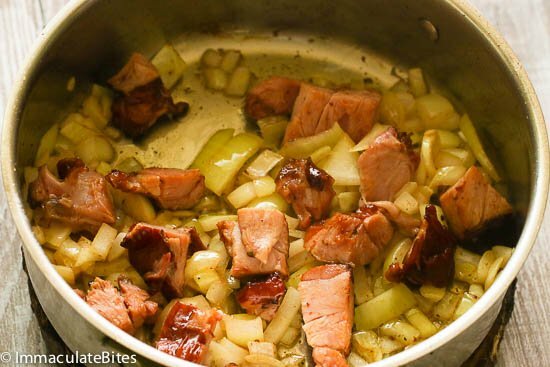 Add the smoked turkey sauté with onions in the oil for 3-4 minutes, stirring often and scraping any browned bits off the bottom of the pot. Through in the spinach, and let it simmer, for about 3-5 minutes. The measurements seem strange. Why no use 1/2 or 1 teaspoon or tablespoon? How can you use .08 of an onion? Right before Thanksgiving I ran across your page using the search feature on instagram, that page is so informative. 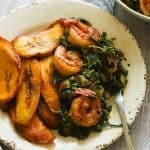 I just want to say thanks for sharing, your recipes are so full of flavor, I have prepared the Sancocho recipe,sofrito,trinidad corn pie,jellof rice and african stewed spinach and i eat spinach all the time just not like this recipe, which is the best that i have tasted all of my life (for real). 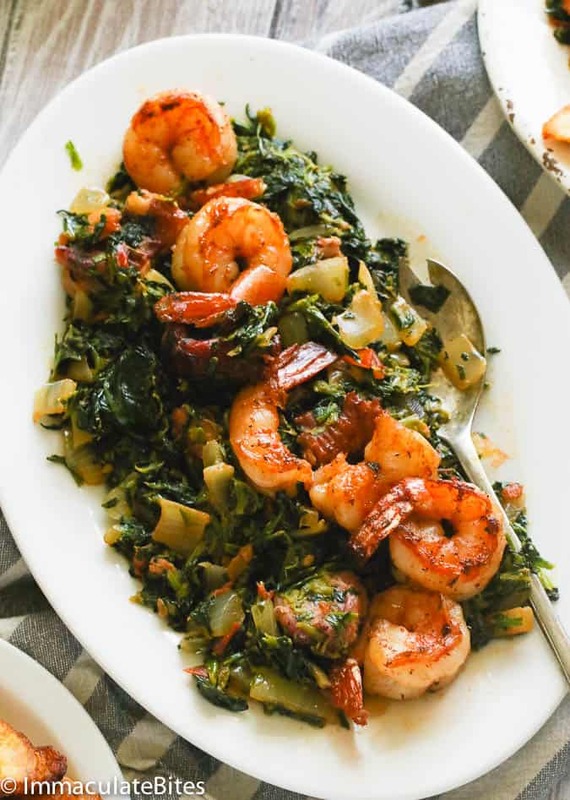 I do a lot of yard work, walking my dogs, stationary bike, so I’ve incorporated spinach, rice, chicken, in my diet for a while with no special time of day to eat it, your spinach recipe has a special place in my diet, even though i love shrimp i only used the smoke turkey and coconut oil, the oil being the only change. I will continue to use your recipes. Looks delicious! Where do you get the chopped smoked turkey from? Do they sell this in stores already chopped, or would you have to buy turkey, cook it and cut it up yourself? Hi Cathy, I use left over cooked turkey. Or you can buy smoked turkey legs or wings and cut into bite size pieces. This was really good, thanks for sharing your recipe! So happy to hear it worked out well for you . 1/2 to 1 cup of oil is too much oil to cook with. To make this more healthier I used 1 to 2 tablespoon. that is more than enough oil. That’s my opinion.. Yes, adjust oil to your needs. Start with a small quantity and add as you go if needed. Thanks for sharing. It’s roma tomatoes and they run pretty small. Hi. First let me say. I’m a big fan of your recipes! I’ve tried several and have loved them all. This recipe was no different but I kept reading over this looking for where to add the tomatoes and didn’t see it in the instructions. I skimmed the comments to see if anyone brought this up and didn’t see anyone mention it there either. I added them where I thought they should go but I didn’t know if you hadn’t noticed that or maybe it’s me? I asked someone to look at it for me and they didn’t see it either. Regardless, I plan to make it again. Thank you! I also didn’t see how to season the shrimp. Hi Krystal, thanks for bringing this to my attention. Happy to hear it worked out well for you. I have rewritten recipe to make it clearer. Thanks again. I just made this now and my my my it turned out awesome! So happy to hear it worked well for you Jessica. Any advice for using fresh spinach? Blanch first for a couple of minutes, let it cool. Then squeeze out the water -and you are all set to start to start cooking. I don’t love spinach and never eat. but when I have tried this recipe, it really tasty and delicious. I love it. I made this with part frozen turnip greens (cooked those a while before I added the frozen spinach). I didn’t have smoked meat so added a few drops of Liquid Smoke. I did cook the shrimps and they were tasty! I also used canned tomatoes. I will be making this often for my family. Don’t skip thawing and draining the frozen greens! Awesome! Totally agree with not skipping thawing and draining – makes a whole lot of difference. Thanks Emily ! You are too Kind. I just made this with fresh spinach and it tastes AWESOME!!! Also made fried plantains. The flavor is amazing. Will definitely revisit this site for more recipes. 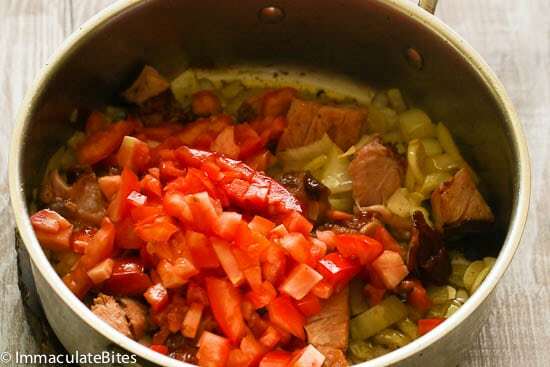 I love to cook and this site seems to have tons of great recipes to choose from. Awesome! Thanks for letting me know. You are going to have a blast going through the archives . Do let me know which ones you try out . Hi what type of smoke turkey? It really doesn’t matter. I use the one available in most super markets, smoke chicken, or fish would work as well. Awesome! Glad you liked it. Thanks for letting me know. Awesome! Nice touch with the chivo. Glad you enjoyed it!!! Kisha, it really doesn’t matter. 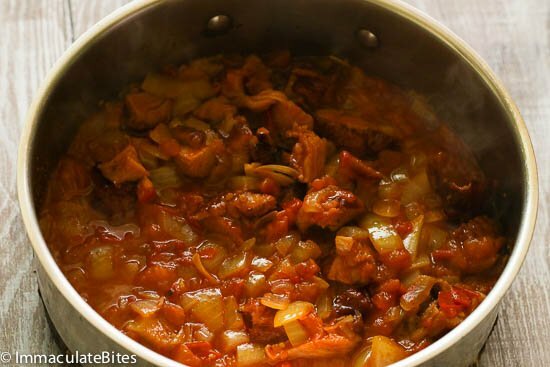 Love this easy recipe – looks like it will be tasty. It is definitely tasty make it all the time. Thanks for sharing this delicious recipe, I added beef tips in mine. Also I was unable to find a Maggi cube so I used Know instead. Megan, thanks for the feedback. I just made this tonight and it was wonderful. Best spinach ever! Just tried this, very nice!! I an your number one fan Immaculate! !